Lewis Hamilton believes Ferrari is yet to extract its “full potential” from its 2019 Formula 1 car at any point so far this season. Hamilton and team-mate Valtteri Bottas outpaced the Ferraris throughout the Chinese Grand Prix weekend, making Mercedes the first team to start a season with three one-two finishes since Williams in 1992. The world champion said that while Charles Leclerc should have won in Bahrain but for power unit problems, Mercedes had positioned itself to take advantage. “I think we are operating with what we have at its full potential,” said Hamilton. “But there will be more performance improvements to come in the future, we will make steps forward. “I think in the last race [Bahrain], you can’t say that was necessarily on full merit, because weren’t quick enough to win the race really. “But things happened along the way and you had to put yourself in position to get the win, so we did that. But I think particularly the first one [Australia] and particularly this one [China], full on merit. “The Ferraris, I think they’re not extracting, [or it] doesn’t look like they’re extracting their full potential on the weekend, and then their execution doesn’t always look as faultless as they have shown in the past. 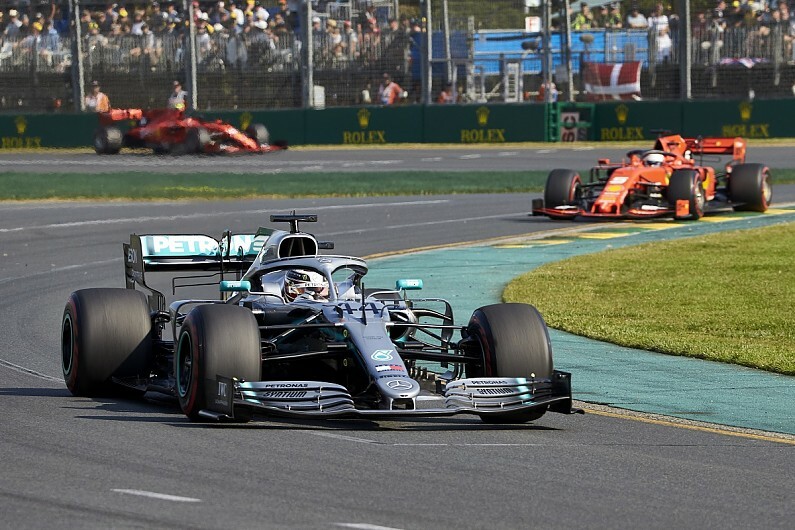 Hamilton has insisted all season that Mercedes genuinely believed Ferrari had the edge after pre-season testing, and that its advantage in the Melbourne season-opener was a surprise. “Sebastian was also quite quick in the last race so it’s difficult to say, but we definitely got through testing [and] we knew that it was very close,” said Hamilton. “We got the car into a window, we knew that it was within a couple of tenths but we did think that they had the upper hand. “I’m just not sure they’ve really hooked up a proper solid weekend just yet, but it was looking like it was going to be a solid weekend for them in Bahrain, and then it started to tail off. “This weekend, they were a bit up and down throughout the weekend. “I’m not really sure where they are losing out, but they’re gaining something like 0.4s on the straights, but losing out on corners, so it will be interesting to see how long they adopt that strategy in the coming races. “But there are still so many races where their car will perhaps outshine ours.